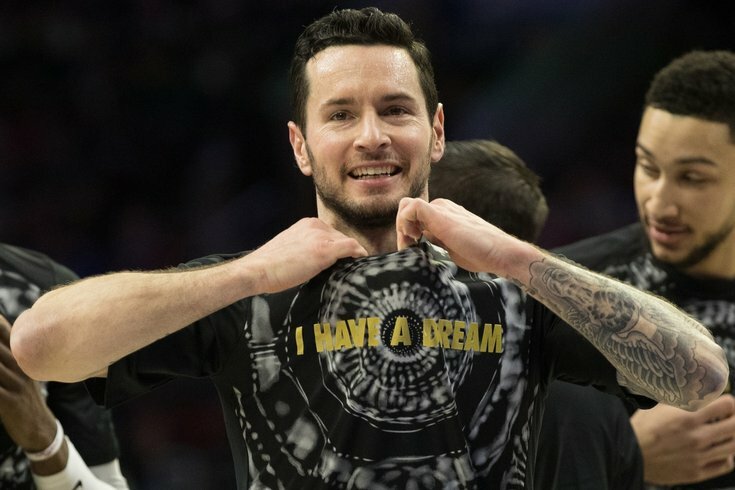 Philadelphia 76ers guard JJ Redick wears a shirt with graphics honoring Dr. Martin Luther King, Jr before a game against the Toronto Raptors at Wells Fargo Center. UPDATE: JJ Redick offered a formal apology for the incident on Sunday night, expanding on what happened and acknowledging the gravity of the situation. A video from the NBA's official partner in China that was supposed to celebrate Chinese New Year is now mired in controversy, following the discovery of Sixers guard JJ Redick using what appears to be a racial slur in the video. The available clip shows a deep cast of NBA players and coaches — including Houston's Chris Paul, Miami's Goran Dragic, and Sixers legend Allen Iverson — sending their best wishes to the league's Chinese fan base as it celebrates the country's yearly festival. China is home to one of the NBA's largest, most rabid fanbases, and the league has worked on celebrating that connection ever since Chinese star Yao Ming sparked a new level of fandom back home in the mid-2000's. You'll notice this initial clip is absent an appearance from the Sixers' player in question. But in a later video attached to a YouTube-style reaction, a clip of Redick saying, "I just wanted to wish all the NBA c***k fans of China a very happy Chinese New Year," has since surfaced. You can watch for yourself below. Because the first video has Redick's appearance edited out, a lot of folks will argue over the level of intent or animosity in the clip. It seems unlikely, though certainly not impossible, that a player as smart as Redick would say such a thing knowing he was recording a message specifically for Chinese fans. Had the Chinese media who filmed the clip initially viewed what he did as a reflection of malice, it's likely the footage would have been released as a standalone almost immediately. Redick seemed to lean into this explanation himself, with the veteran guard claiming the slur is, "not in my vocabulary" in a Tweet addressing the situation. But arguing over the manner in which it has surfaced or even the intent behind its use would really be missing the point. It's a bad look for Redick regardless, who is typically one of the more well-spoken and thoughtful players around the league. This is not a situation where "a slip of the tongue" is an acceptable excuse, just as it wouldn't be if what he said was a slur demeaning people from another ethnicity or background. PhillyVoice reached out to representatives with the NBA for further comment on the situation, and Sau Ching Cheong, the NBA's Senior Director of China and Asia Communications, deferred to Redick's clarification on the matter. The 76ers, when asked for comment, also deferred to Redick's explanation of the situation.